My craft room isn’t quite finished yet, but I thought I’d show you the progress I’ve made since last week. 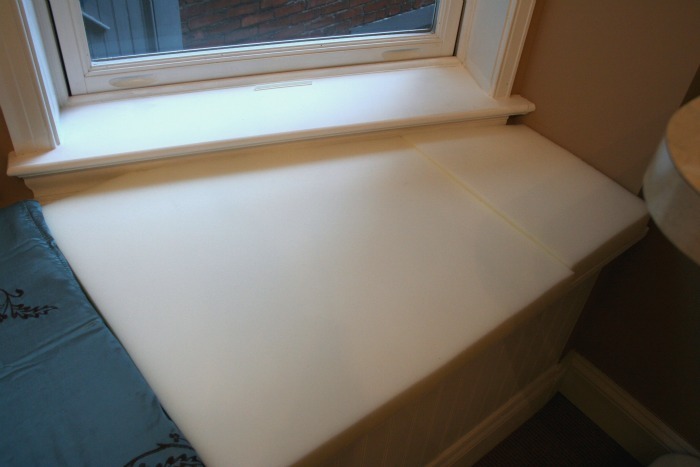 Over the weekend, I finished painting everything and made some cushions for the window seat. The foam (which is ridiculously expensive) came from Ollies at $5.99 a piece. (Note to self: Go into the foam selling business.) 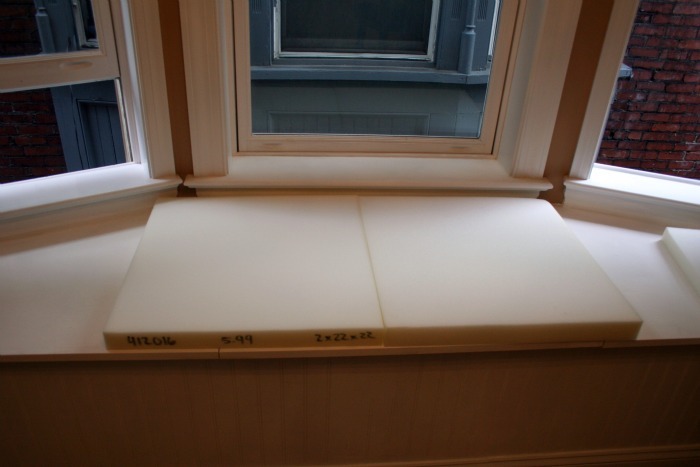 I have a hinged storage compartment in my window seat so decided to make three cushions out of five pieces of foam. I hot glued two cushions together to make the center cushion. For the fabric, I found a blackout drape for $16 at a store called Gabriel Brothers. It was so perfect with three layers of material already there for me! It had the top silk layer, a fleece layer that acted as my batting, and a bottom “sheet” layer. 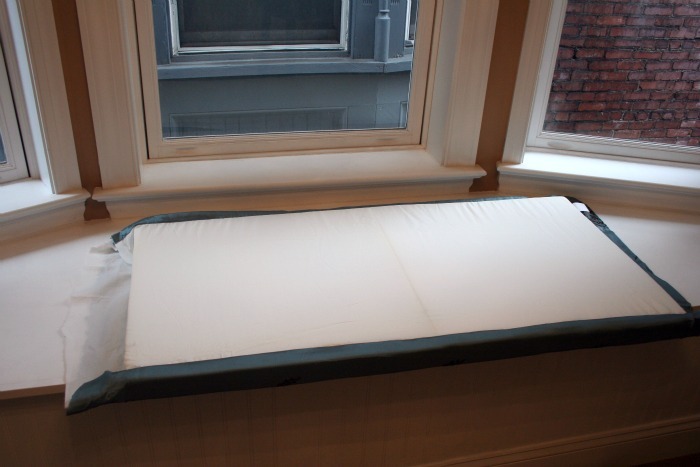 I stuffed the foam into the curtain, folded the bottom layer over the cushion, and glued it right to the foam. Then I flipped the cushion over and folded it like a present and glued it in place. Yep. Glued it. I love hot glue and have great success with it! For the side cushions, I measured and cut the foam with scissors and glued the pieces together to make a one-piece cushion. 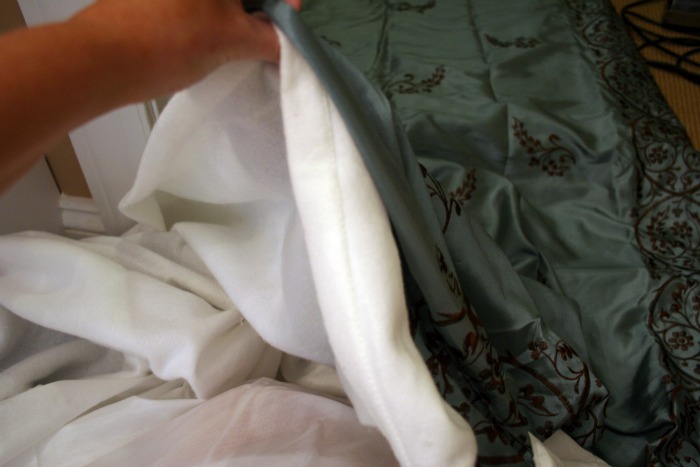 Then, I repeated my method of folding and gluing the fabric into place and…. …voila! 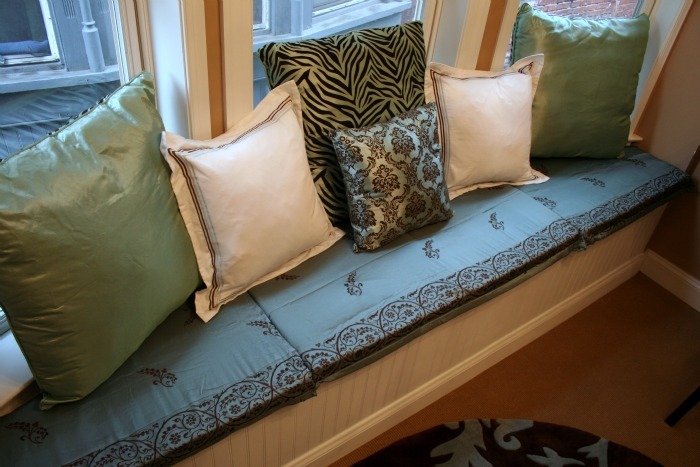 No-sew window seat cushions! I’m still working on my pegboard and organizing the rest of the room and when it’s completely finished I will give you a full breakdown of where everything is from. Here is a quick glance at the other side of the room. With my left-over foam, I whipped up a little cushion for my temporary desk chair. And here is one more look of how it is coming along! I’m loving it so far! Exactly what I was looking for! I can’t sew to save my life and I’ve spent hours on line looking for cushions for my new window seat. I couldn’t find anything I liked and I definitely wasn’t willing to pay the big bucks for custom cushions. I actually have a pair of drapes I am no longer using that will match my room perfectly. I’m going to try this, although I too am concerned about how I am going to keep it clean with 3 little kids in the house. I guess I can just keep re-hot gluing? Yes, this isn’t a great option in a high-traffic area. 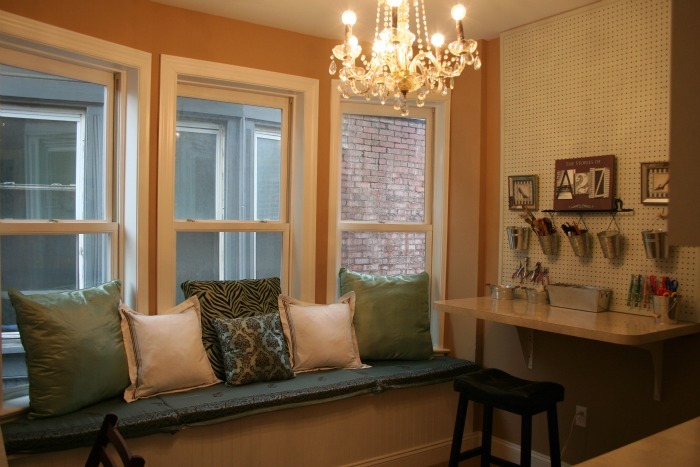 My craft room window seat is typically only used by me and sometimes to read stories to the boys. So far the cushions have held up just fine but if your cushions will be used daily, you probably won’t be happy with the results. I love this idea, only problem is my dog loves to sit at our window seat and watch the backyard. Is foam washable or is this a spot clean kind of thing regardless of the material used? Thanks for the great idea! This room looks great! 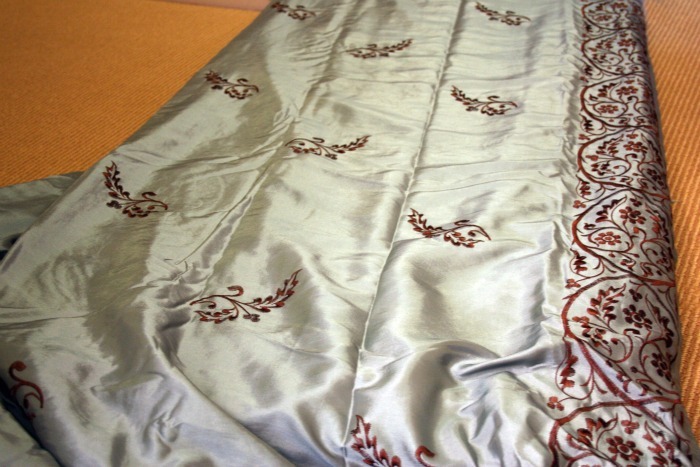 I love the fabric along with the accents in your room its very elegant looking. Where is the rug from? I love the pattern! So very cute!! And I love your ‘temporary’ desk chair..you’ve given it a great personality..can’t it stay? LOL! Love your ideas…discovered you while I was pinning on Pintrest…Smiles!! I love your pillow idea! I’m really crafty but have NO idea how to sew anything heavy duty so when I came across your blog I was SO relieved. I’ve got everything I need…except foam. For the life of me I can’t find anyone who sells it! I know you said Ollies but absolutely none of the places you mentioned on here sound familiar to me. I’ve tried looking online and still can’t find anything except mattress pads. Any ideas? That looks great! P.S. I love me some Gabriel Bros! The space looks beautiful – so much personality. It is so nice when we can create a space of our own. The window seat is dreaming. I am sure you will be spending a lot of time here from now on. 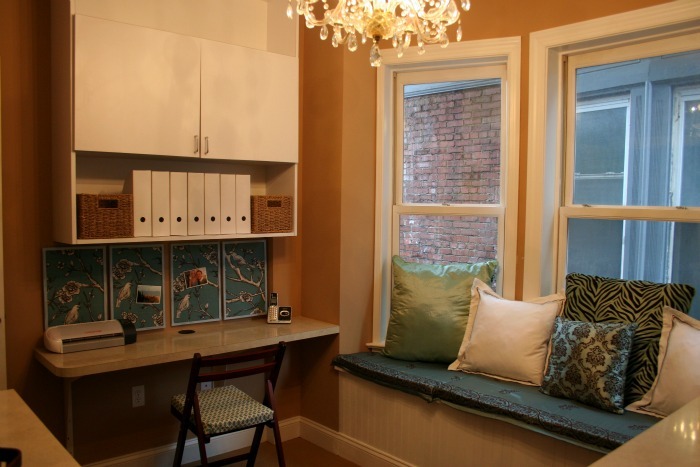 I LOVE everything about your craft room….aaahh that chandy is FABULOUS! 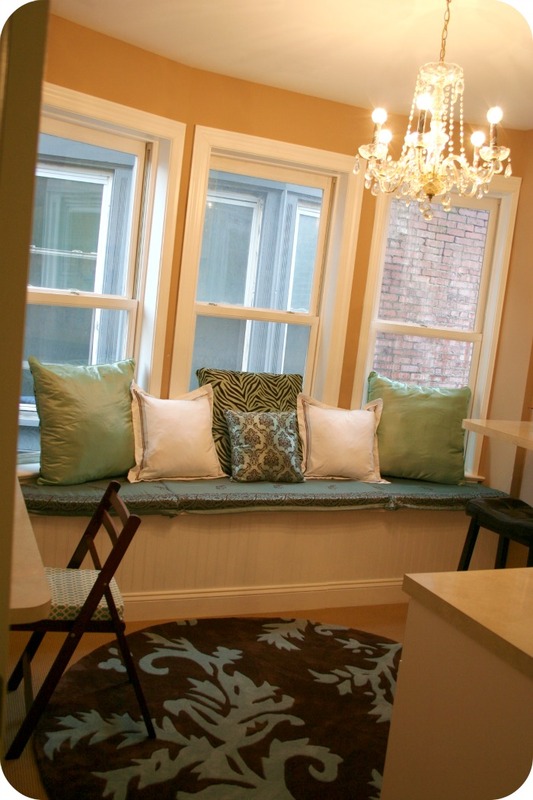 Love the colors you chose, and that window seat is so crafty!! Your house is very cozy! I love the cushions! And that art table thing you have is the best! Very nice. I wish I had a room like that. Love the chandy and the window seat. I’ve always wanted a room with a window seat. So cute! The pegboard/craft area is fabulous! You just gave me a great idea ! Your craft space is looking great! It makes me think of an adult hideaway spot. I’ve always wondered why foam is so expensive. 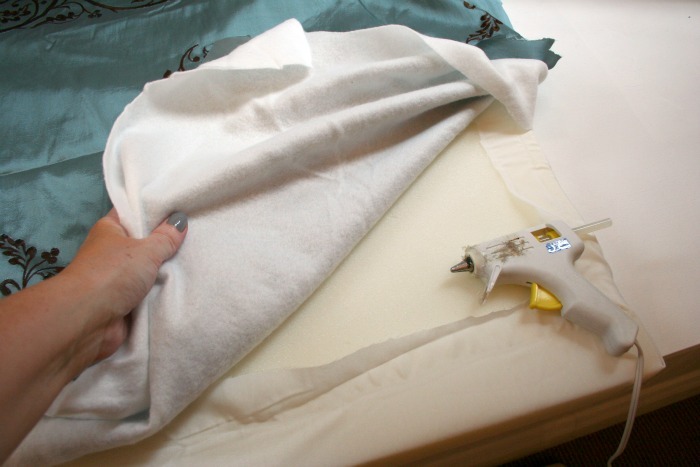 Your idea to glue your fabric to the foam is certainly easier than trying to sew a cover and then wrestle the foam into the cover. It looks fantastic. I love my hot glue gun! Love the look and I love Gabe’s too 😉 They have some pretty great deals there sometimes. The pics look great and were totally worth falling off the chair for teehee!! That is crazy awesome! I would have never thought the hot glue would work on the foam! You go girl! It all looks so neat! It looks great so far Beth! Foam is expensive. Sometimes I buy cushions on clearance at the end of summer just for the foam! It looks great! Can’t wait to see the finished room. 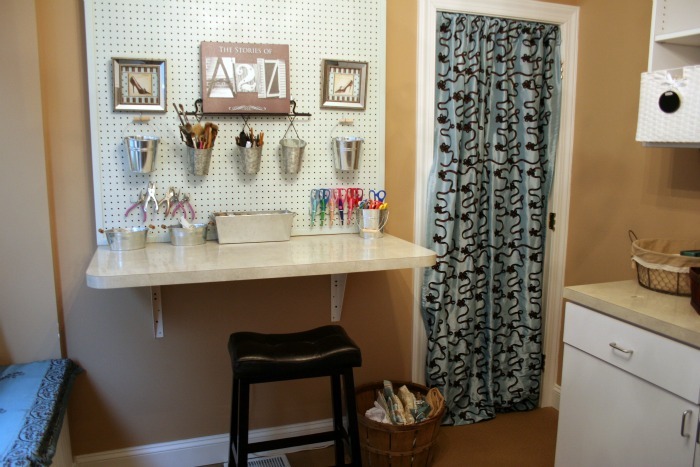 This is one upscale, elegant craft room! Aww, it’s really coming together! No-sew are my favorite kind of projects. Thanks for sharing, Beth! So cute Beth! Love the colors you have chosen to work with and the chandelier is fantastic! I am loving the peg board with the little galvanized pails hanging from it! So cute! OH, I am loving this! I could cozy up on that window seat alll day. Seriously–wish I had this space. 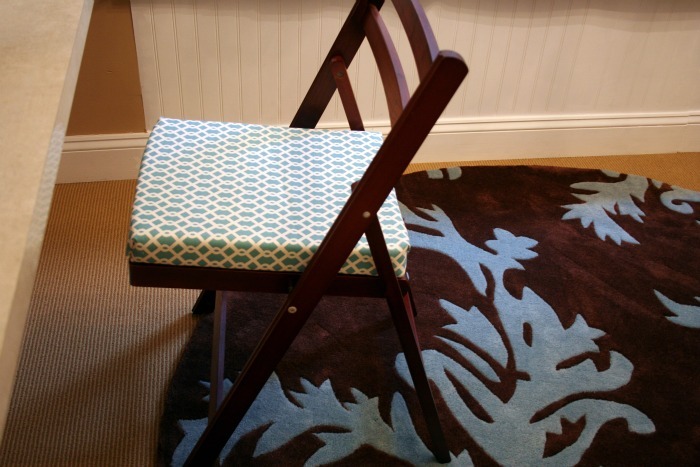 What a brilliant idea to glue the seat cushion! Gluing I can do–sewing, not so much.